Reclusive screen star Elizabeth Taylor might have been speaking on behalf of all of Michael Jackson's fans when she emotionally lamented the loss of her longtime friend. "We shouldn't have to be here," Taylor told fellow mourners at Jackson's funeral on Thursday, Sept. 3. "It shouldn't have happened. He shouldn't have passed away." Nonetheless, nearly 200 of Jackson's closest friends and family members tried their best to say goodbye to the entertainer at Forest Lawn Memorial Park in Glendale, Calif. Even his shyest show-business friends attended, after shunning the massive public memorial in July. Longtime pal Macaulay Culkin sat with girlfriend Mila Kunis, while Jackson's ex-wife Lisa Marie Presley gave his mother Katherine a tearful embrace. Taylor was perhaps the most impressive of the guests. After publicly proclaiming that she would not be part of the July memorial's "hoopla," she gave in to a more private display of sorrow at the funeral. "She shed some tears," says one guest. Held in the shadow of Forest Lawn's Great Mausoleum on a warm summer night, the service proved a fitting setting for such star-studded grief. A "Thriller"-esque moon tinted orange by smoke from the nearby forest fires added to the dramatic backdrop. The specially built stage was adorned with six large bouquets of white lilies, white roses and green topiaries. Portraits of Jackson served as bookends for his casket. 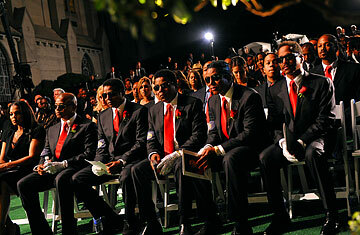 Jackson's family was not upstaged by the evening's more famous mourners, dominating the affair that began with his brothers Jackie, Tito, Jermaine, Marlon and Randy serving as pallbearers. Randy then escorted Jackson's three children, Prince Michael, Paris Katherine and Prince Michael II, to the coffin, where the children laid a crown at its head as a tribute to the King of Pop. They then returned to their front-row seats, near their grandparents. There was no repeat of Paris's touching moment at the memorial when she tearfully addressed the crowd, calling Jackson "the best father I could imagine"; during Thursday's ceremony, the children stayed silent. "But they were very composed and strong and would have made their father proud," says the guest. Family patriarch Joe Jackson was also front and center. He was one of the first family members to arrive at the event, exiting one of their five rented Phantom Rolls Royces with his grandchildren in tow. A controversial figure, Joe spoke at the funeral in defense of his son. "He felt people had been trying to cheat Michael," says the guest. "He said that they will find out what led to Michael's death. And said they will not rest until they found out." Jackson's lesser-known friends were also given a moment to share their memories of the fallen star. The spontaneous speeches were some of the most poignant. One in particular was delivered by David Rothenberg, a burn victim whom Jackson took care of for years after 90% of his body was scorched in a childhood fire. "He was very scarred over all of his body," says a guest. "He spoke about Michael and how he cared for [Rothenberg] for so long without asking for anything in return. It was very moving." At the end of the ceremony, Jackson's brothers led a procession of guests as they carried his casket into the Holly Terrace of the Great Mausoleum. Each person was allowed one final, personal farewell before walking away. One guest pointed to longtime Jackson family friend Clifton Davis' rendition of "Never Can Say Goodbye" (a song he wrote for the Jackson 5), performed earlier in the night, as a fitting summary of the collective sentiment. "[Davis] stopped the song at the end and said, 'Michael, we can't say goodbye,' " the guest recalls. "'But what we can say is that we love you.' "
"That sent shivers down my spine," says the guest. "It was so emotional. And so true." See TIME's tribute to Michael Jackson and coverage of the events surrounding his death.